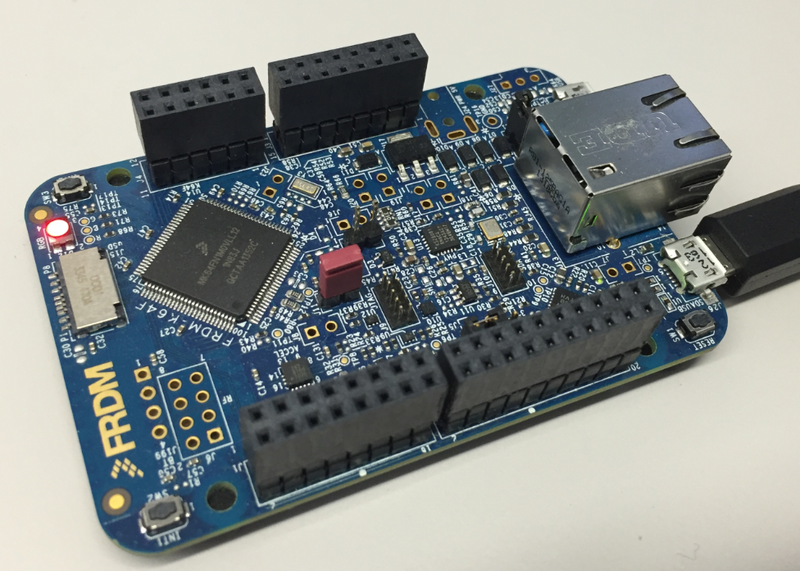 This tutorial shows how to install and develop on Linux with the NXP MCUXpresso SDK. 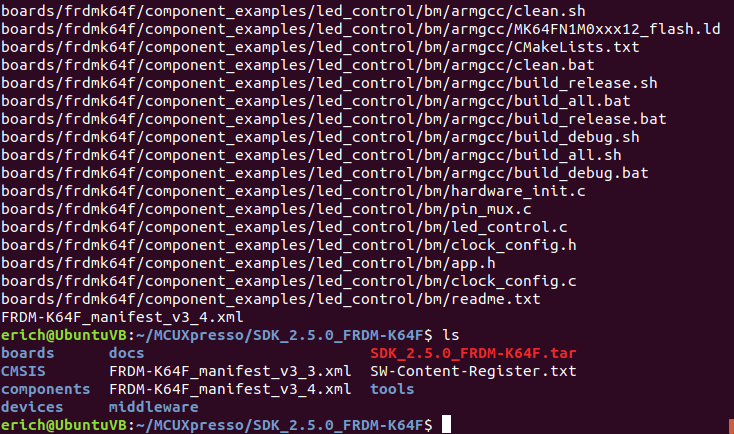 It goes through the steps all the needed pieces and to build one of the SDK example projects. 💡 If you want to develop the easy way with MCUXpesso SDK using a GUI: The MCUXpresso IDE (Eclipse based) runs on Ubuntu (and Windows and Mac) too. This article uses make files and no GUI for a ‘headless’ or ‘GUI-less’ environment. 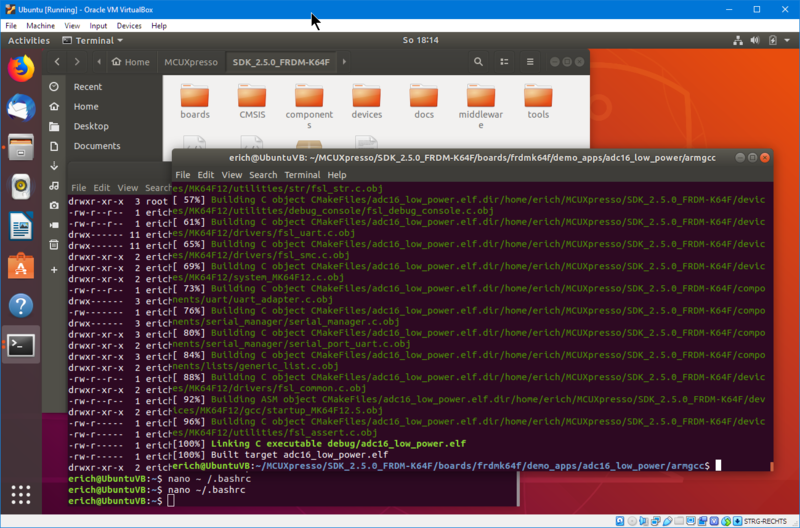 I recommend using Ubuntu Linux. I’m using it in a VM (Virtual Machine) on Windows 10 with the Oracle VirtualBox. There are plenty of tutorials available on the internet about installing Ubuntu on VirtualBox if you are not familiar with it. CMake is a cross-platform make file *generator*. As with the make file syntax, it takes some time to learn using. To learn more about CMake: there are plenty of resources available online, a good starting point is https://cmake.org/. 💡 I’m using cmake 3.10.2. The SDK documentation recommends using an older version 3.0.x. Using the 3.10 version will show warnings like ‘The CMAKE_FORCE_C_COMPILER macro is deprecated. Instead just set CMAKE_C_COMPILER and allow CMake to identify the compiler.’ because the SDK cmake files are not compatible with newer cmake versions. The warnings are annoying, but do not affect the functionality so they can be ignored. 💡 The reason for this is to separate different GNU ARM Embedded Toolchains for different projects. If I would add it to the global path/system, separation would be very difficult. And then add it to the file which gets executed every time I log in as this user. Use CTRL+X to exit nano and to save the file. The shell script to generate the make file are using cmake (see above) with all the necessary information for cmake in the CMakeLists.txt file. With this tutorial I showed the installation of the necessary tools (SDK, cmake, GNU ARM for Embedded toolchain) and how to build example projects. In a next part I’ll touch on the debugging part with gdb. Until then, I hope you find this one useful. 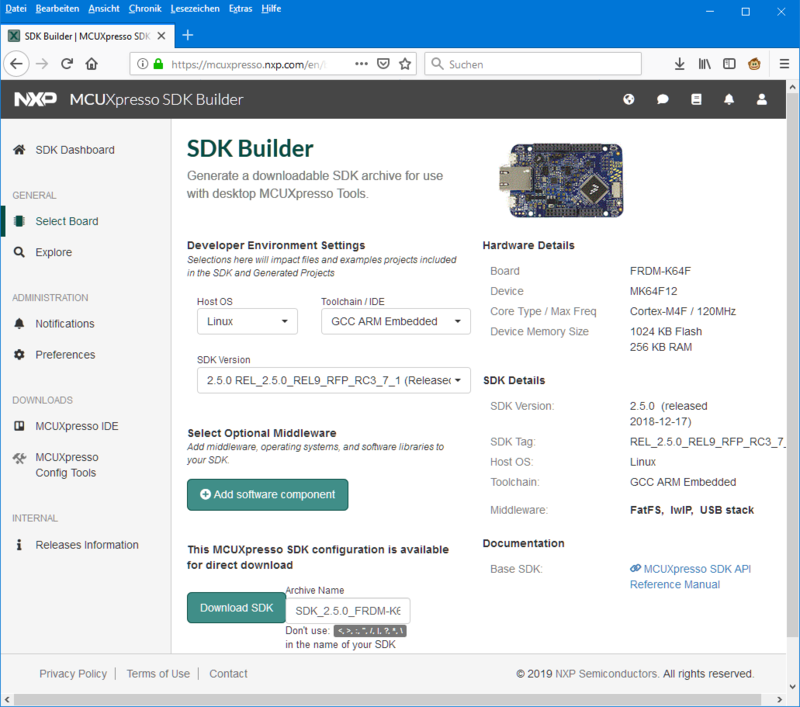 This entry was posted in ARM, Boards, Building, CPU's, Embedded, FRDM-K64F120M, gcc, Kinetis, Linux, MCUXpresso, MCUXpresso SDK, NXP, SDK, Tips & Tricks, Tutorial and tagged ARM, arm gcc, Building, CMake, FRDM-K64F, freedom board, gnu gcc, Kinetis, Linux, MCUXpresso, NXP, Oracle, software, software project, technology, Tips&Tricks, tool chains, Tutorial, Ubuntu, VirtualBox by Erich Styger. Bookmark the permalink. An interresting alternate solution is the new Microsoft Windows Subsystem for Linux (WSL), which is basically a gimmick that implements most of the Linux kernel functionality on top of the existing Windows kernel and filesystem, without having to virtualize it. You can install multiple different Linux distributions on top of it (each system is practically a different folder in your home), and even run them at the same time. I guess most of the tools you presented before run very well inside WSL. If you install an X Server on Windows (like vcxsrv), you can also start graphical applications, like Eclipse or Visual Studio Code. I had the same thought, so I just ran through the whole thing on WSL (Ubuntu) and it all worked except I had to unbzip2 by hand, vs. using tar xjf. I should have written “bunzip2”. is there anything wrong using tar instead of bunzip2? Maybe I need to change my habit using tar for .tar files? I did apt update, apt upgrade. But I have never changed it beyond that since the feature was first released to the Windows Insiders Fast Ring. I think the latest WSL release includes Ubunutu 18 LTS, which later updates to a quite modern distribution. I managed to upgrade the WSL release and now the tar understands the bzip stuff. Curiously when the Linux part says it needs to reboot, it requires rebooting all of Windows, not just the Bash window. Which sorta surprises me. Yes, that’s weird, but on the other hand there is no Linux kernel, the entire functionality is provided by the Windows kernel, re-cosmetised/extended with a new API that behaves like the Linux kernel, so major system changes cannot be handled by restarting the Bash terminal, which is exactly this, a shell running in the new Linux kernel environment. Thanks for reminding me about WSL. I have tried that about 6 months ago, but I did not like it that much. Maybe it was too early or I did not invest enough time. The Oracle VirtualBox has worked for me very, very well over years so I did not see a reason to change, but maybe I have to look into WSL again. I recently updated my QEMU build scripts to run on WSL/Ubuntu, to create Windows executables intended for debug sessions (active QEMU development cycles on Windows). When such a tight integration is needed, WSL is probably more convenient, since you can start Windows executables from a bash terminal, and/or dirrectly access the entire disk with posix paths (like /mnt/c). When isolation is needed, obviously VirtualBox is the answer. The only possible problem I identified with WSL is that it stores the Linux filesystem directly in the Windows filesystem (it is true that the location is quite hard to find); the Linux specifics are stored as extensions, which are not updated if the files are accessed from Windows, so it is strongly recommended to not access the Linux files from Windows, since this can corrupt some files (I did not try, but I guess some attributes like set uid/set gid can be lost). Here’s some info about accessing the Linux files from Windows. Similarly I have used VMware for much of my Linux for many years. It works well and I see no reason to change, either. I just thought it would be interesting to see if the WSL could do it. The Windows 10 I used for this was running in a VM. I’m one of those people who refuses to ever move to Windows 10. So it doesn’t boot natively anywhere for me. 🙂 I’m kinda hoping to reverse my VM situation during 2019. So I boot Linux natively and run Windows in the VMs.